Mr. Friday speaks at a celebration of the SOHP’s twenty-fifth anniversary. Supported by a special gift of $25,000 from the William R. Kenan Charitable Trust, the project focuses on the broad social concerns of William Friday. 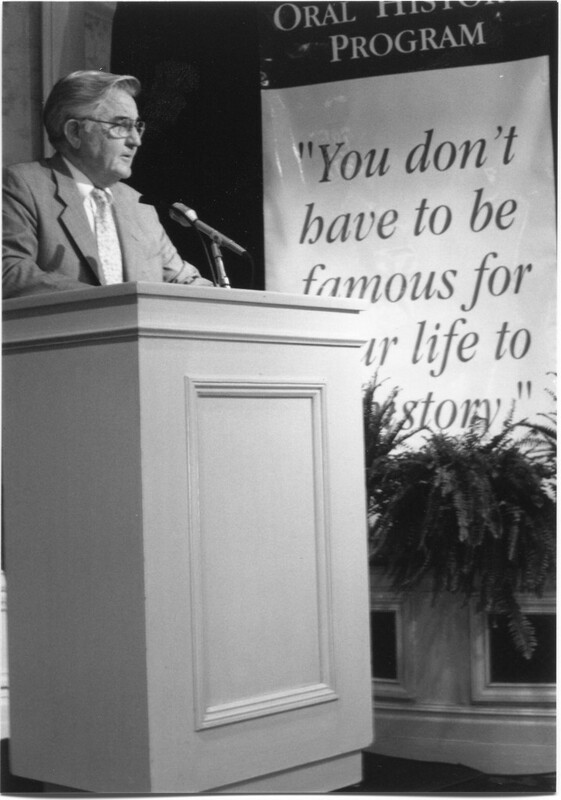 As President of the University of North Carolina from 1956 to 1986, Mr. Friday made incalculable contributions to the university, to the state, and to American higher education. As Executive Director of the W. R. Kenan Charitable Trust and as President Emeritus, he continued to lead the way on a wide range of issues, including education, poverty, and economic development. The many organizations and institutions he advanced included the National Center for Family Literacy, the Rural Economic Development Center, the Progress Board, the Knight Foundation on Intercollegiate Athletics, the Golden Leaf Foundation, the Center for Creative Leadership, the North Carolina Poverty Project, and the Commission on the Future of North Carolina. Building on the interviews we conducted with Mr. Friday on his contributions to the university, the “Service to the State of North Carolina: The Legacy of William C. Friday” project documents the ongoing efforts of his key collaborators and their successors to meet the social and economic challenges of their times. We began with two lengthy videotaped interviews conducted by Ferrel Guillory and Hodding Carter covering the post-1986 period, with a special emphasis on the Knight Commission. We then completed a series of interviews with Mr. Friday’s close collaborators. These included Thomas S. Kenan III on the Kenan Trust; Valeria Lee on the Golden Leaf Foundation; Billy Ray Hall on the Rural Economic Development Fund; Father Theodore Hesburgh on the Knight Commission; and Gov. Jim Hunt. We have also conducted more than thirty interviews on the Center for Creative Leadership. In 1981, Governor Hunt appointed Mr. Friday chairman of the newly created Commission on the Future of North Carolina. Tasked with anticipating the changing needs of the state, the NC 2000 Project sought to engage not only experts but also thousands of citizens in drafting recommendations to guide current and future leaders. Their report offered broad goals and specific policy recommendations related to four major areas: people, economy, natural resources, and community. As chair of the Committee on Poverty and Civic Responsibility in 1986, Mr. Friday issued “A Statement to All North Carolinians” aimed at opening a public dialogue on poverty in the state. Those efforts evolved into the North Carolina Poverty Project, which Mr. Friday chaired, and which set out to educate the public about the economic and moral challenges poverty posed to the state. In our final round of interviews, we focused on individuals who worked closely with Mr. Friday in these and other organizational efforts to confront North Carolina’s challenges and on people who have carried on this legacy in their own ways. We included participants in the NC 2000 Project, members of the North Carolina Poverty Project, and other individuals active in anti-poverty efforts across the state. In addition to documenting a variety of issue-oriented approaches to poverty (such as literacy, education, housing and economic development,) we explored a range of approaches to affecting social change. These approaches include direct service, policy advocacy, community organizing, community development, collaborative community change, and electoral politics.